Because of its isolation for over 400 years, the Peruvian Paso horse has evolved as one of the purest breeds in the world and as a unique entity in the horse kingdom. The existence of this breed has been called "the greatest triumph of genetic selection ever achieved by a group of breeders." Thanks to its unique, inborn, four beat lateral gait, the Peruvian Paso horse is undoubtedly the smoothest riding horse in the world. The trademark of this breed is a special, inherited, and completely natural four beat lateral gait called paso llano. The paso llano is a broken gait. It consists of a permanent, harmonic, and rhythmic tapping in which the animal makes a gentle and pleasant alternating movement. 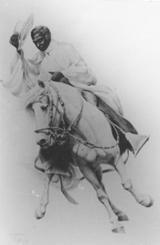 It is a quick advance in which the center of the horse's gravity stays almost immobile, producing a smooth ride. Until the seventeenth century, the majority of the world's horses were naturally gaited. 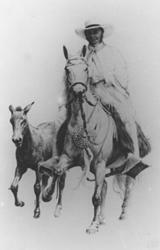 Nearly all traveling was done on horseback. Horses with natural gaits were considerably more comfortable to ride than trotters, which were called "bonebreakers." Trotters were better suited for pulling carts and carriages for long distances, as well for horseracing. As these uses for horses eclipsed travel riding, the numbers of trotters grew. 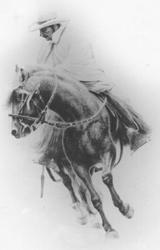 The Peruvian Paso remained one of the very few breeds that not only retained its natural gait, but was celebrated for it. The modern Peruvian horse descends from the horses introduced into Peru by the Spanish in the sixteenth-century. 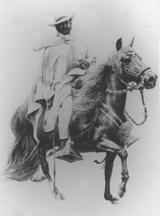 The Spanish Conquistadors brought with them both Hacks (amblers) and Chargers (trotters) of the same breed to the New World, and as recorded in the Archives of the Indios, the Spanish horse, the classic Andalusian, was a breed consisting of Galician (Celtic) horses of the North, Sorraia, and Barb of Morocco. In Peru, the classic Andalusian horse became the foundation for the Peruvian horse, which has kept most of the characteristics that made the Andalusian so valuable during the conquest of South America. It is interesting to note here that the Andalusian horse in Spain has since changed through the influence of other European breeds introduced by foreign Royal Houses that ruled Spain for two centuries. The Peruvian Horse is a "hot blood," a purebred Spanish horse that was selectively bred for the amble after reaching the shores of Peru. No outside blood has been introduced into the Peruvian breed, as there was no need to cross with other breeds to produce taller, heavier or faster horses, as was the case in other countries such as Mexico, Argentina or the United States. The Peruvian horse was mainly developed to satisfy the need for a smooth and comfortable ride when overseeing plantations and travelling from one settlement to another. Selective breeding coupled with such factors as climate and forage, served to modify succeeding generations and create a new breed, which possess characteristics different from those of any other horse in the world. Peruvian Paso horses come in all basic, solid colors as well as greys and roans. The average height of the Peruvian is between 14 and 15.3 hands (1.42 - 1.54 m.) and the weight is commonly between 900 and 1,100 lbs., about the same as Morgans and Arabians. Today's Peruvian Paso horse is the result of 400-plus years of highly selective breeding. The breed is said to combine qualities which may be considered "contradictory." He is very high-spirited - though easy to handle while loose and relaxed in his movements. He has sparkling, brilliant action in the forelegs - yet he is extremely smooth and sure-footed. He has a refined appearance - yet he is powerful. This has been accomplished due to the intelligence, love, and devotion of innumerable breeders (many anonymous). Their arduous and silent work has made the Peruvian Paso horse one of the country's greatest treasures and a unifying source for its people. Peruvian tack is the result of over 400 years of tradition. It was shaped by the need for comfortable rides over long distances and difficult terrain. Owners of large estates often needed to cover more than 40 miles per day to manage their property. The bridles, which can take up to a year to make, are made from a double layer of hand-woven rawhide. They have matching halters, which allow the horse to be dismounted and tied quickly. They also have the distinctive eye patches, or tapa ojos, which allow the horse to stand, waiting for its rider's return, when nothing is available to tie it to. This is often the case in the high plains, where most shrubs are less than a foot high. The saddles, also handmade, are built to easily distribute the body weight across a large portion of the horse's back, thus minimizing strain on both the horse and rider. These saddles feel like a comfortable cross between a dressage and Western saddle. The saddles also have the guarnicion, or tailpiece, a remnant of the Conquistadores traditional tack. Our saddles have detachable saddlebags, which come in handy for picnic lunches. A distinctive element of Peruvian tack is the wooden box stirrups, or estribos. When the Spaniards arrived in Peru, they could find no local source of iron for making stirrups. As a replacement, they designed the box stirrup from wood, and began to adorn the stirrups with silver. Reins and bridles are also often ornately adorned with handmade silver decorations. The box stirrups may feel strange at first to those used to smaller English irons, but riders will soon come to appreciate their comfort. **This article and pictures courtesy of Eduard van Brunschot Vega.